The Arctic Sunrise is visiting the Great Pacific Garbage Patch - a soupy mix of plastics and microplastics, now twice the size of Texas, in the middle of the North Pacific Ocean. What is Greenpeace doing in the Garbage Patch and how do we solve the root causes of this problem? Debris from a fishing net seen underwater with MY Arctic Sunrise ship in the background. One of Greenpeace’s foundational principles is bearing witness. We use our bodies and our voices to shine a spotlight on injustice and to tell the story of what we see in a powerful way that makes inaction no longer possible. 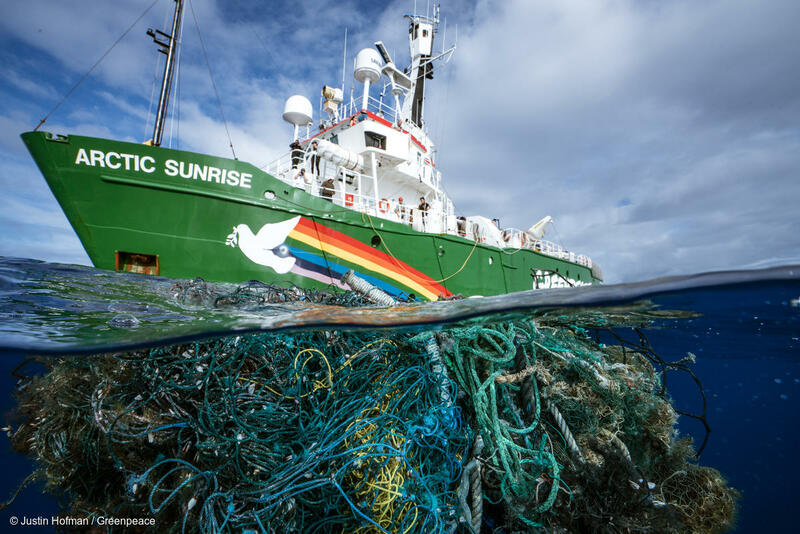 That’s why right now, Greenpeace and the Arctic Sunrise is visiting the Great Pacific Garbage Patch to investigate the impacts of plastic pollution on our ocean and coastal communities. The Great Pacific Garbage Patch is a soupy mix of plastics and microplastics, now twice the size of Texas, in the middle of the North Pacific Ocean. Every minute of every day, the equivalent of a truckload of plastic enters our oceans, finding its way to the middle of the garbage patch. That’s about 7 truckloads of plastic in the time it takes you to read this article. Put another way, there are as many as 51 trillion microplastic particles in the sea, 500 times more than the number of stars in our galaxy. It’s difficult for the mind to comprehend that magnitude of plastic, so how do we deal with this problem? While cleanup efforts are commendable, in order to truly tackle this crisis, corporations have to stop producing so much plastic and pushing an unsustainable throwaway culture. Think of it this way: if your bathtub was overflowing, you wouldn’t immediately reach for a mop. You’d first cut off the water at the tap — the source — which is what we have to do with plastic production. 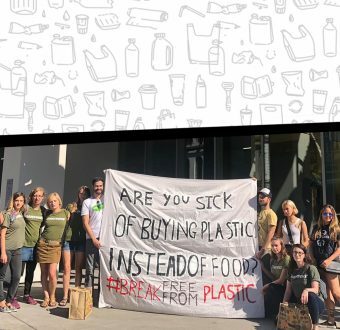 Communities worldwide are already fighting back against the single-use plastics that are forced upon us by corporations like PepsiCo, Coca-Cola, Nestle, Procter & Gamble, and Unilever. Folks are auditing their communities and naming the corporations who are most responsible for the plastic pollution they find. Cities and states are passing laws to transition away from single-use plastic and some companies are already taking steps to reduce their plastic footprint. 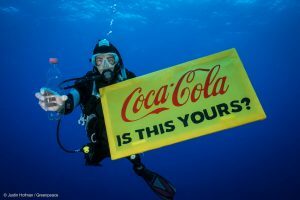 A Greenpeace diver holds a banner reading “Coca-Cola is this yours?” and a Coca-Cola bottle found adrift in the garbage patch. Our work in the Great Pacific Garbage patch is to shine a light on the nature of the problem, and the true culprits. We’re collaborating with scientists from Scripps Institution of Oceanography and the University of Hawai‘i to further our understanding of the devastating consequences of the spread of single-use plastics. As ocean conditions permit, the crew are doing comprehensive investigations of what they find in the Garbage Patch. Here’s a bit more on what they’re up to. Microplastic research: Once they enter our oceans, plastics never go away. They fragment into smaller and smaller pieces called microplastics, which are smaller than 5mm. Once a day in the Great Pacific Garbage Patch, the crew is using a special net on loan from 5 Gyres Institute to collect microplastic pollution. We’re recording what we find with scientists to analyze the types of microplastics that we find. Debris Patrols: During daylight hours, we are on the lookout for floating mats of trash to document and record location information using RHIBs (rigid hull inflatable boats), drones, and by sight. Our dive team documents the marine life traveling with these mats to help scientists study how plastic has become a vector for invasive species. Identifying branded trash: The crew is on the lookout for branded trash so that we can continue our work to challenge corporations to do their part in tackling the crisis they helped create by reducing their plastic footprints. Most trash that makes it to the Garbage Patch has been in the ocean for a very long time and is degraded beyond recognition. So far, though, we’ve found over 10 branded pieces of trash (single-use plastics to bigger items like trash cans) from well-known brands like Coca-Cola, Unilever, Schick, and Rubbermaid – 1000 miles from California. 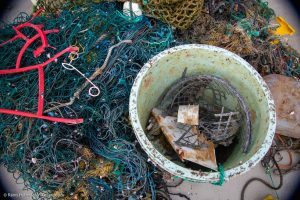 Satellite tracking: Deploying and recovering satellite trackers on large mats of floating debris in collaboration with Ocean Voyages Institute and the University of Hawai‘i. 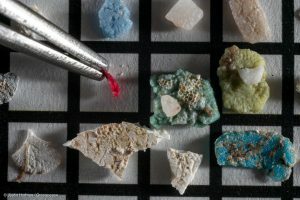 Microplastics collected at the surface of the Great Pacific Garbage Patch. Pieces are laid out on a 5×5 mm grid. How do we protect our oceans and tackle the plastic pollution crisis? At its root cause is the excessive production and marketing of single-use plastic. Otherwise, we’re just mopping up the floor, as the tap continues to run. But it doesn’t have to be this way: Greenpeace has a long track record of challenging corporations to take responsibility for their actions and winning. With enough people power, we can turn the tide on plastic pollution. We hope you’ll join us because to break free from plastic, it will take all of us doing everything we can. Now, while the spotlight is on the Great Pacific Garbage Patch, is a crucial moment to challenge those most responsible for creating this problem. 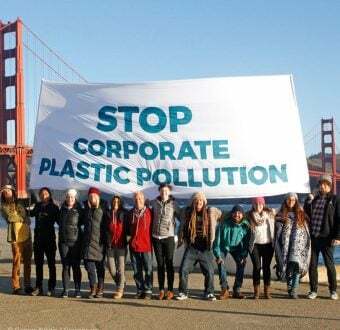 I invite you to be part of the solution by taking a moment now to sign our petition to top US corporate polluters, challenging them to immediately phase out single-use plastic. To continue following the ship’s journey, head here.